I can't for the life of me figure out how to build a highlight reel in the new Matterport workshop, and I find that a bit disconcerting seeing how the legacy version is going to be switched off in a few months. I know that when you're in the new workshop you can "Add View", and then take a snapshot which will then be added to highlight reel. That said, there doesn't appear to be any way to insert snapshots that you already have into that highlight reel, or am I missing something? In the classic version its simple: you have all your snapshots showing up in the top area and you just drag them to the bottom bar. However, I don't see any mechanism like this in the new showcase. Also, I don't see where you can toggle between slide show and walkthrough mode for highlight reel on the new showcase. For now I'm stuck using the legacy version, but I'm worried what will happen when they shut legacy off if all the existing tools aren't available in the new version as I make a highlight reel for almost every Matterport model we produce. Someone correct if I'm wrong but I think you can't add snapshots anymore. 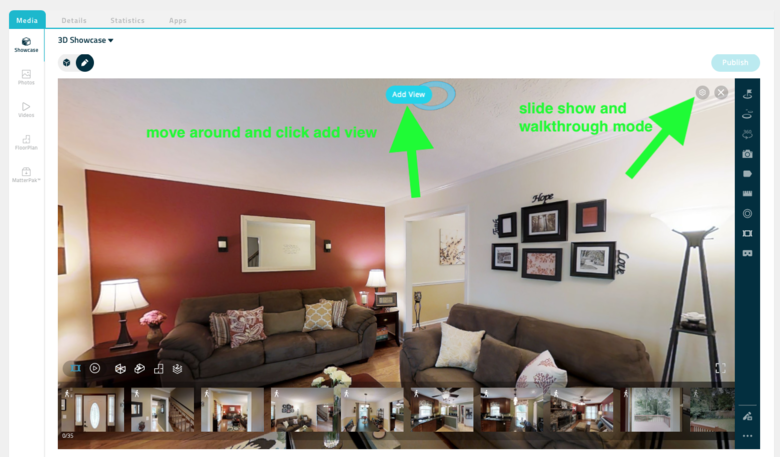 If you want to add a 360 view, you have to open the 360 photo first then click highlight reel and then click add view. I was hesitant at first, but having built several highlight reels in beta, I far prefer the new way. It is more streamlined I feel and more stable. I start in dollhouse and then add two views to highlight reel- one I use at the beginning and one at the end. I then walk around the tour and add to view, you can click and drag to rearrange. When in highlight reel mode, in the upper right of the screen there is an option to go to settings, click that to toggle between walkthrough or slideshow view. Hope this helps, good luck. It’s more simpler and elegant for me. I select the highlight and then toggle back to the photo icon for a snapshot. From there, I move on to the next scene and do a snapshot and then toggle back to highlight. So it’s a back and forth rhythm thing! I think the settings are at the bottom right to show the highlight reel and walking tour. Best, (after publishing and before sharing) I like the highlight reel functionality. Play back the highlight reel and if it pans differently than what you expected, pause and switch to edit. Position the image again, hit highlight and it drops another image below in the reel. Delete the previous one in the reel and publish before playback. There’s no need to get a snapshot as you’ve already obtained the image you wanted. Click on the tab on the left for photos, select all and download.They can be surprisingly acceptable for a Matterport Pro2. Tip: keep the verticals correct for a professional look.